The importance of salt can not be overstated, particularly when it comes to meat. Though I’ve never not salted my ground beef before smashing it in the pan, it took a trip to a faraway land for me to realise that there was still room (on the patty) for improvement (more salt). Before I went to Copenhagen, I watched and read as many shows and articles on the town as I could, and noticed a certain amount of enthusiasm for Gasoline Grill, an “American style” burger joint that started out (and still exists) in a gas station. And while I can’t say I agree with all of their stylistic choices — they used brioche buns (too sweet and soft) and cheddar cheese (doesn’t melt well) — I will say that the visually alarming amount of salt they use made for an extremely delicious patty of beef. As Alice and I watched them make our burgers, we were positively enthralled by the handfuls of salt they poured on each side of the patty — you could see a coating of white from several yards away. If a toddler were to grab as much salt as they could hold in one hand, that would give you a good idea of the scale we’re talking about. The salt (obviously) flavours the meat, but it also helps to create a fantastic, deeply savoury crust that gives the burger the taste and texture it needs to hold its own against many toppings. Also, I noticed that the fine people of Gasoline Grill grind their pepper directly on top of the melting cheese, which is honestly very smart, as it ensures the pepper stays put, and doesn’t get burnt by the grill. It’s quite elegant, really. 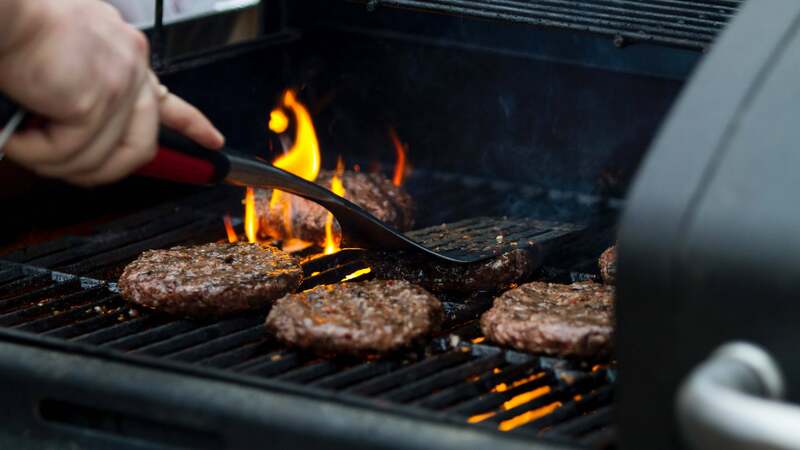 One thing to remember: In your quest to aggressively salt your burger, make sure to apply the sodium chloride to the meat right before it hits the griddle, as mixing salt into the meat will give you a dense, bouncy puck of beef, and that’s not what we’re about. Incorrectamongo. Yes salt is required for good tasting meat. All the chefs add salt to the burger mix, and then whilst cooking. I say rubbish. Better Homes and Garden's lady cook, sorry I forget her name, said add salt when almost finished cooking. Pasta, rice, meat everything. Since that airing I have done just that, and found my food tastes better, used less salt, and did not etch good cookwear with sodium. So, I say did the advocates of salt first ever try comparing it with salt last. I doubt it. If you want to draw water out, salt first. If you want salt to move deep into the food, salt first. If you want the food to remain juicy, usually chicken or turkey, brine it before cooking.